The NHS Breast Screening Programme began in 1988. It aims to invite all women aged 50 - 70 years for breast screening once every three years. Nationally the programme screens 1.3 million women each year and diagnoses about 10,000 breast cancers annually. The screening programme also offers women over 70 a free breast screen every three years. These women will not be sent an invitation but are encouraged to call the unit to make an appointment that suits them. Currently we invite more than 65,000 women from the region for breast screening. To enable women to be screened closer to home, breast screening is carried out at a number of sites across the region. The NHS Breast Screening Programme is subject to monitoring by the Quality Assurance Reference Centre(QARC). It ensures rigorous quality assurance standards are maintained. In December 2007 the department of Health’s Cancer Reform Strategy announced that the NHS BSP would be extended to cover women between the ages of 47 and 73. This means that all women will get two extra screens in their lifetime. It also means that eventually women will get their first screening invitation before their 50th Birthday. The age extension will be phased in across England over a six year period, with full coverage before 2015. Before that begins, however, a pilot study is being undertaken in 5 areas across England. 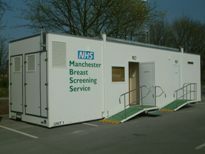 The Greater Manchester Breast Screening programme is one of those sites. Around half of the women aged 47 to 49 and 71 to 73 years of age will be selected at random to receive screening invitations this year. Please click on the link below to see a range of videos designed for women with learning disabilities.